French Flintlock Pistol Dagger: Flintlock firing system, 18th century. Unique pistol-dagger combination. Length: 15", Weight: 1.2 lbs. 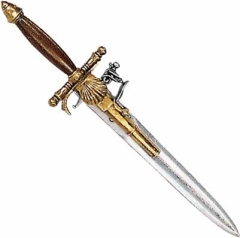 See details Elegant French Dagger/Pistol. Elegant French Dagger/Pistol: This 18th century combination piece features simulated. ivory handle. The hand guard, pommel and barrel have a simulated. antique brass finish. Length: 14.5", Weight: 1 lb. Decorator model. Hunting Flintlock Dagger Pistol. 11.5” embossed blade, wood grips and a flintlock firing system. Features: Overall length: 16.5” Weight: 1.7 lbs. Our Beautifully Replicated D-Guard Pirate Scimitar is 32 inches long and weighs 3 Lbs. The Detail of this is amazing. 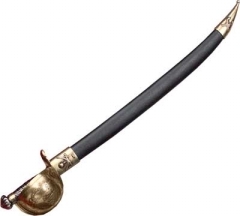 Pirate Boarding Cutlass: Features include a brass full bowl guard, pommel and wood handle. 23.5" curved carbon steel blade fits into leather scabbard with brass furniture. Length: 30.5", Weight: 2.4 (Replica Steel Pirate Cutlass) Blades Not Full Battle Worthy.